With the Rocky Mountains as your backdrop and 300 days of annual sunshine, Denver makes an unforgettable wedding destination. 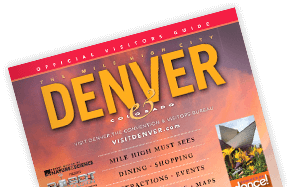 From contemporary cityscapes to outdoor settings amidst ancient boulders, VISIT DENVER is your complimentary resource for planning your special Colorado event. How do you start the planning process? Just follow these steps. This may be the only part of planning a wedding that VISIT DENVER can&apos;t help you with. But it is a necessary part! So go out and find that special someone who you can&apos;t wait to spend the rest of your life with. If you&apos;ve already done so, skip directly to Step 2. Brainstorm! What kind of wedding have you always dreamed about? A grand affair with hundreds of guests or an intimate gathering for close friends and family? Do you want a ceremony in the great outdoors (a Colorado specialty) or a one in a charming wedding chapel (another Colorado specialty)? Check out the easy-to-use event facilities guide on this website for a comprehensive database of venue spaces. You may also want to peruse the City of Denver&apos;s marriage information page, which has a wealth of "nuts and bolts" info on how to get married in the city - where to get your marriage license, who can officiate and plenty of other tips. Also think about budget - not the most fun part of the planning process, but something that will be useful as you move forward. Don&apos;t skip this step! VISIT DENVER is an unparalleled resource for wedding planning in the Denver area, and its services are absolutely free - "absolutely free" not being a phrase you will encounter very often as you prepare for the big day, unfortunately. This will save you a lot of time, if you don&apos;t have the energy or hours to contact dozens of venues and service providers - VISIT DENVER will do all the groundwork for you by getting your needs out to all the appropriate vendors based on your request in one fell swoop. The Tourism department has an in-house wedding expert - she helps plan dozens of Colorado weddings every year. Email her at tourism@visitdenver.com and talk to her about what you&apos;re looking for. She can then send out details of your needs to a wide array of wedding-related vendors who are tried and true in their various areas of wedding expertise - restaurants for rehearsal dinners, bands, caterers, florists, venues, rental equipment, you name it. She can also help you with accommodations for your guests by securing hotels and room rates, not to mention setting up a room block if necessary. Sit back and wait for the various vendors to get back to you - it won't take long. Design your save-the-date cards and invitations. Spend a little time browsing your favorite wedding publication and daydreaming about the big day. Make plans for your honeymoon. VISIT DENVER can help you sift through the bids from vendors and can help you start solidifying your plans, including setting up meetings with vendors and site inspections. This is the fun part - picking and choosing from the best the Mile High City has to offer! Take your time! 7. Send out those invitations! Head to the post office and drop off your invites - the big day is rapidly approaching! When you start to get RSVPs back, you can begin sending your confirmed guests info about Denver and the surrounding area - attractions, accommodations, transportation, and more (see step 8). Family and friends coming in town to celebrate your big day need to be kept busy, so you&apos;ll love our list of itineraries, guaranteed to help find something fun for everyone to do while they&apos;re here. You can also check out Denver365, the official Denver events website for info on what else is going on in the city the week of the wedding. Or you may want to consider a professional tour guide for the group. You can also send complimentary copies of the Official Visitors Guide or a discount coupon book to guests as they plan their travel. Finally, you may want to pass along this link to convenient information for getting around Denver, by plane, train, or automobile. Get in touch with the important people in the wedding - the caterer, the officiant, the bridal party, the venue manager - and confirm any last minute details. As you&apos;ll discover throughout the process, planning a wedding is all about the details! Congratulations! This is what all those months of planning have been leading up to. Take a deep breath and get ready to begin the next chapter of your life! And don&apos;t forget to relax and enjoy your Mile High wedding! Get detailed information on what VISIT DENVER can do to help you plan your wedding! VISIT DENVER is an unparalleled resource for wedding planning in the Denver area, and its services are absolutely free! With the Rocky Mountains as your backdrop and 300 days of annual sunshine, Denver makes an unforgettable wedding destination. Have a bachelorette weekend full of urban adventure in Denver, Colorado!